This fascinating picture, showing a lottery taking place in a Bristol public house around the mid-1820’s is an intriguing insight into a type of gaming that has been practised in various forms and at various times throughout this country’s history. Recent research has confirmed that a Queen Bess Tavern stood in St Nicholas Street in Bristol and was pulled down around the years 1860/1. The question of who the artist was is interesting. On the back of the painting he is named as ‘Old Willis’. 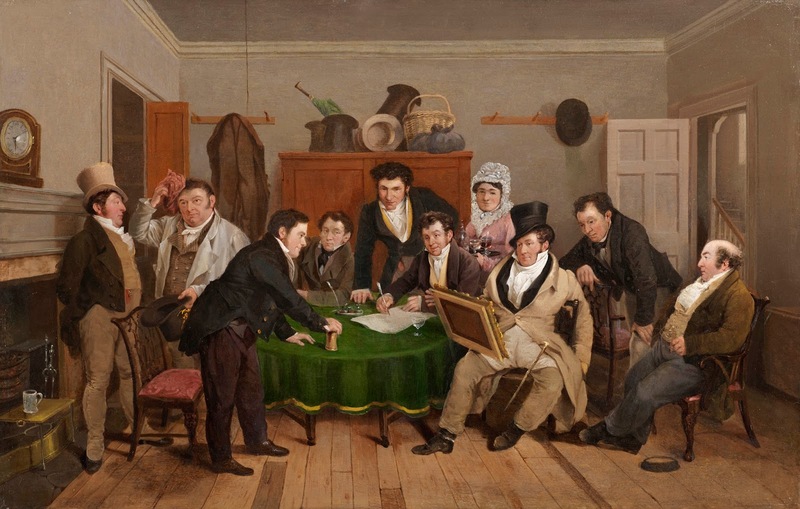 There are two painters called J. Willis who are in the Bristol exhibition lists of the 1820’s. The elder of the two is thought to be the most likely painter. The clue is in a tellingly similar image in the Witt Library files of an early 19th century picture of a cottage interior, with a group around a table in a manner identical to that in the Queen Bess picture. It would therefore appear that the artist we are looking for is Bristol artist John Willis Senior. With thanks to Bristol Museum & Art Gallery for this research. The cost of the painting was £15,000 split equally between The Friends of Bristol Art Gallery and the Friends of Bristol’s Museums, Galleries & Archives. Because of its subject the painting will be displayed first in M Shed’s ‘In the City’ Gallery before being shown in the Bristol Museum & Art Gallery.